Title:The Warrier. High Quality Oil Painting on Canvas,Genuine hand-painted. We have over 100 contracted artists to paint fine Oil PAINTINGS of the Masters Works.Most of our artists have long history of precision in detailed replication of original art. Artist - Monica Stewart. Title - Flow. Fine Art Print on High Quality Paper. Image Size - 24" x 32". 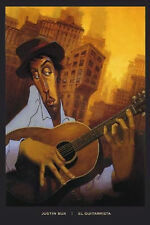 Limited edition and sign by Lashun Beal. Title - El Guitarrista. Artist - Justin Bua. Fine Art Print on High Quality Paper. Paper Size - 24" x 36". Artist - Justin Bua. 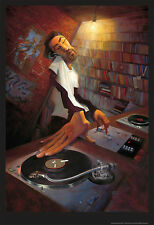 Title - The DJ. Fine Art Print on High Quality Paper. Pintura hecha a mano en papel de corteza AMATE, de etnia nativa de México. لوحة مصنوعة باليد على ورقة النباح AMATE ، من العرقية الأصلية في المكسيك.মেক্সিকো নেটিভ জাতিগততা, AMATEছাল কাগজ উপর হাত দ্বারা তৈরি পেন্টিং। Боядисване, направено на ръка върху хартия за корекция наAMATE, на местното етническо население на Мексико. Title - Kanazawa in Moonlight (Buyo Kanazawa Hassho Yakei), 7th month, 1857. Artist - Ando Hiroshige. Fine Art Print on High Quality Paper. All of our Prints are from the Authorized Publishers. Artist - Justin Bua. Fine Art Print on High Quality Paper. OUT OF PRINT LAST ONES . "Sistahood" By Charles Bibbs. Numbered and Signed by Artist. 36" high and 48" tall. "THE SINGER" - OIL ON CANVAS - PRIMITIVISM ART - UNIQUE ! This is a really unique piece !! By Charles Bibbs. "Totem Series". "The Change" By Charles Bibbs. Limited Edition 400. Title - Dharma II. Artist - Chris Donovan. Fine Art Print on High Quality Paper. By Charles Bibbs & Gilbert Young. Edition 1720/ 2000 Lithograph. is a SOLD OUT Limited. Fantastico Oleo original representandola elegancia de una mujer afro. Amazing original oil painting representing a typical Afro woman. Size:49.41" x 25.59". The painting was done in the style of Impressionism. This boy just only 12 years old. This picture he painted in 12 years. The picture is painted with a brush. The main background picture sand and blue. Item: original painting by Haitian artist, recent era, signed "Edgard.". We understand it shows Tainos seafaring cultural symbols of fish, lizards, butterflies and faces using impasto acrylic and sand texture on a wood panel. Redeem Yourself. by Rodney White. This art is suitable for framing. Product Code AB67237. As long as is it within reason, we will do whatever we can to make things right. By Charles Bibbs. Ebony Series 8- Purple. Limited Edition 500. This is an original hand signed painting by Rachid TZBINOU titled "THE SIXFACE GUITAR". This is print #82 of 350. It is in excellent condition! (See photos for condition). Painting shows Krishna is dancing with Radha(Krishna's girl friend) and gopis(female friends of Krishna). The depiction of minutest details with sheer perfection celebrates the radha's love for Krishna. Artist - Romare Bearden. Title - Falling Star, 1979. Fine Art Print on High Quality Paper. Image Size - 8" x 10 1/2". All of our Prints are from the Authorized Publishers. By Charles Bibbs. 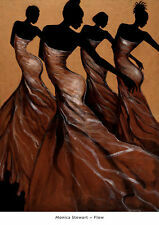 "Ebony 3" Series. Limited Edition 2000. This painting was painted by my wife wich is graduated at a finearts faculty from iassy romania. ----youll enjoy this painting. By Charles Bibbs. "Guardian Angel". Aztec Maori Polynesian Indian Chief Cultural Tribal Oil Art on Canvas, Mayan Native Warrior Painting. Print or Poster are available also contact me for any inquiries, & pricing. Native Indian Landscape: Height 27in x Length 40in. Native Indian Portrait: Height 35in x Length 24in. Original Authentic Indian Oil Painting on Canvas are Available, Contact me for any inquiries on original or print version. 1 painting per purchase. Check out all my exclusive items on: Stores.ebay.com/DeLaMundo .. For any questions contact me on eBay Messenger. For Returns The Item has to be returned Brand New With Tags/Box, Exactly How You Received the Item: or 20% Restocking Fee. Artist - Justin Bua. Fine Art Print on High Quality Paper. All of our Prints are from the Authorized Publishers.